Wekiwa Springs State Park is approximately 20 minutes North of Orland and approximately 45 minutes North of the attractions. It is easily located off Interstate 4 at exit 94. Take State Road 434 West to Wekiwa Springs Road. Turn right on Wekiwa Springs Rd. and travel approximately 4 miles to the park entrance which will be on the right. Please call the park if additional directions are needed. Wekiwa Springs State Park comprises approximately 8,000 acres of wild scenery that offers an opportunity to see how areas of central Florida looked when the Timucuan Indians speared fish in the spring-fed creeks and stalked the uplands. The bicycle trail is a shared trail and is marked with a red blaze. Bicyclists are free to use any of the park's service roads. Bicycles are allowed on the hiking trails in designated areas. You are also permitted to use the horse trail. 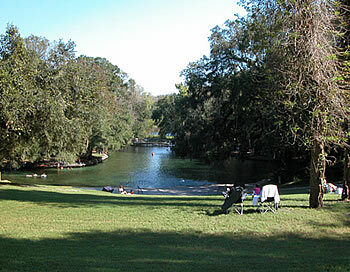 Wekiwa Springs State Park has sixty (60) campsites. Each campsite has water, electricity, in-ground fire circle with a grill and a picnic table. There are two (2) backpacking campsites located along our 13-mile hiking trail. Maximum site occupancy is ten (10) people. Along the Wekiva River and Rock Springs Run are four (4) designated canoe campsites. Maximum site occupancy is ten (10) people. Tram Bed Horse trail is approximately eight (8) miles long and is divided into two loops. 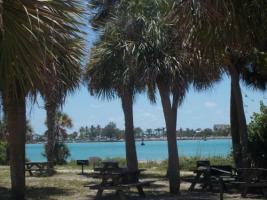 The 13.5-mile hiking trail was developed by and is maintained through the assistance of the Florida Trail Association. Trails are marked with white, blue and yellow blazes. Picnic areas and shelters are provided in the spring area and the Sand Lake area.